Medical plant Mondokaki usually grown as an ornamental plant in the yard and in the parks. Originally plant from India, spread across Southeast Asia, and other tropical regions, and can be found from the lowlands to 400 m asl. A much branched erect shrub, 0.5 to 3 m high, round wooden rod, latex-containing milk. Single leaf, thick skin, where the line of sight, nine short-stemmed. Strands of leaf shape oval or elongated ellipsoid, tip of the base and tapering, flat edge, polished surface of the mat, bone pinnate leaves, 6-15 cm, 2-4 cm wide, green color. Flower stalk out of the armpit leaves, one or a pair, short with some flowers. 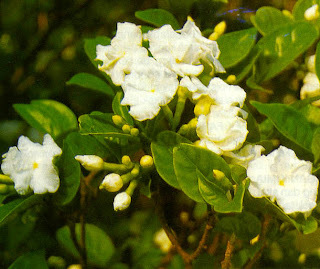 Flowers are usually double, white with yellow middle section,Propagation of the medical plant by cuttings or grafts. PART USED: Root, leaves, flowers and bark. - Preventing the onset of inflammation in the wound. - Swollen and sore throat, cough. - Broken bones (fractures), toothache. - Bites of venomous animals such as scorpions.